A sermon for All Souls’ Day, 2014. The lectionary readings are Wisdom 3:1-9, Psalm 130, 1 Thessalonians 4:13-18, and John 5:24-27.
in tuo adventu suscipiant te martyres, et perducant te in civitatem sanctam Ierusalem. May the martyrs receive you in your coming and may they guide you into the holy city, Jerusalem. May the chorus of angels receive you, and with Lazarus, once poor, may you have eternal rest. If one has an even slightly musical ear, there are certain occasions in the church year that call for particular music. At Christmas, there need to be carols, and it wouldn’t quite be Christmas unless “Joy to the Word” were sung at some point. On Easter, “Jesus Christ is risen today,” needs to happen—or the musician and/or priest at a church that ignores that hymn is probably not going to last very long. On All Saints’ Day “For all the saints” rang out in this place and around the world. And then, for the handful of churches that observe All Souls’ Day, a Requiem Mass or parts of a Requiem Mass sweep us up into the company of those who have gone before us, singing, praying, remaining quiet, all in the hope and assurance of the Resurrection to Eternal Life. In paradisum is an antiphon that for thousands of years has been sung at the conclusion of a burial mass, as the body is being borne out of the church. It is sung or said at the end of the Commendation, just before actual Committal. The words for “Into Paradise” are included in our Prayer Book as an option, but it is an option I almost always take, if possible. I love to have a soloist or the choir sing it, or to have the whole congregation sing the English version in our hymnal. In paradisum consists of three sentences, really. And the richness of the images reminds us that we are never alone—not in life, not in death, and certainly not in eternal life. The three sentences surround us with angels in the first, with martyrs in the second, and in the third sentence, we have Holy Lazarus as a friend and companion. “Into paradise, may the angels lead us.” Angels are messengers. In scripture they sometimes bring challenging news—like when the angel wrestles with Jacob, or the angel announces to Mary that she will conceive. But they also bring comfort and hope—as they did to Abraham and Sarah, to Joseph, and again, to Mary. Angels lead us, and those we love, from this life into the next. We follow in their light, in their hope, and in their joy that earth simply cannot contain. And then there’s Lazarus. Luke’s Gospel gives us the story of a rich man who sees the poor around him as servants or potential servants. At death, this rich man, nicknamed “Dives,” sees a poor person he recognizes, Lazarus. He expects Lazarus to wait on him and serve him. Lazarus symbolize all the world’s poor and forgotten, the people we pass on the street, the people we mean to speak to, or think about sharing a dollar with, or intend to send a check to. Lazarus is the poor, the diseased, and the excluded of this world. But in the next, Lazarus is Lord and leads the welcome party. Lazarus and those like him have ascended and are rich in ways that will shock the rich in this world. 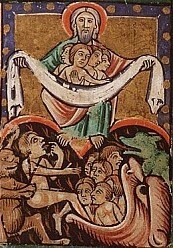 In heaven, Lazarus signals the great reversal that is going on. All is redeemed—nothing is lost. All are fed—no one goes hungry or lacks anything. All are loved—no one is forgotten. Into paradise we go, with angels, with martyrs, with Lazarus. In paradise we meet our brother Jesus who welcomes us to the party that has already started, where all those we have loved now are. We hear our name, not just from the Good Shepherd who calls out, but from God and all God’s beloved—from aunts and uncles, from grandparents and ancestors, from friends and even from enemies. All Souls come together in a great, loud, multilingual ALLELUIA. May the songs of this day strengthen us and support us. Especially on this day, let us give thanks to God for those we have loved and who have died, those who we see as through a veil, until that day, when with the angels, and the martyrs, and Holy Lazarus, we, too, enter eternal rest. Amen. A recording of the Gregorian In paradisum from the Liber Usualis (1961), p. 1768-1769, sung by the Alfred Deller Consort can be found here.